Looking for a Ferry to Bilbao from Portsmouth? 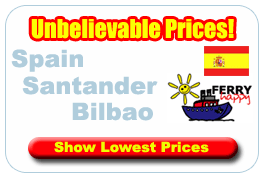 Well, P&O Ferries operates sailings from Portsmouth to Bilbao in northern Spain twice each week. Portsmouth ferry port has an irresistable array of culture, history and heritage and is fastly becoming Britains most popular terminal.The outward journey departs in the evening and after two nights at sea arrives in port first thing in the morning. The return trip is made in quicker time with just one night spent on board. All the usual shopping and dining facilities are on board, as well as a cinema, fitness suite, swimming pool and casino. Bilbao is a busy city with great cultural attractions in its own right as well as being the gateway to northern Spain and the Pyrenees. Sailing to Bilbao with P&O Ferries is so easy - whether you're camping with your family, surfing with your mates, skiing in the Pyrenees or staying at your holiday home, you can pack as much as you can fit in your car! With P&O ferries you get superb onboard facilities plus great entertainment.P&O Ferries depart from Portsmouth and offer the most convenient cruise style crossings to Spain for car and passenger. Our overnight cruise style crossings mean you can enjoy a whole lot more leg room than other modes of transport! The sights can be rather more interesting too - you'll enjoy exhilarating sea views and fresh air as you stroll on deck. There's so much to cram in onboard the Pride of Bilbao and we're not just talking about all the tempting food in our restaurants. We have live entertainment, two onboard casinos, saunas and a gym. We've also got a Steiners beauty salon if you want to pamper yourself. At the end of an evening enjoy a good night's sleep in your comfortable en suite cabin. Upon arrival in Spain, you'll have the freedom to drive anywhere on the Continent. Bilbao is an ideal starting point for travelling on to Spain, Southern France and Portugal as it cuts out the long drive through France. Thanks to our civilised departure and arrival times, you're certain to be in the holiday mood. Excellent motorway connections from Bilbao mean that you can be in Madrid in around three hours, alternatively the laid back villages of the North are a perfect escape for those looking for a real taste of Spain. Bilbao offers arguably Europe's best surfing, and the ski resorts of the Pyrenees are well within reach.